12th International Peat Congress under the topic "Wise use of Peatlands"
Vast areas of peat swamp forest (PSF) cover the coastal plains of Central Kalimantan from the coast of the Java Sea to the provincial capital of Palangka Raya, to Sampit, to Pangkalanbun and further North. PSF is among the earth's most endangered ecosystem, with a huge carbon storage capacity, extremely fragile to disturbance. Several Landsat ETM images 118-61, 118-62 (2003 only), 119-61 and 119-62, acquired between 1999 and 2003, were compared using detailed multi-temporal analysis. These images show major changes in this largest remnant of tropical peatland related to extreme rates of deforestation, the worst fires in 2002, since 1997. 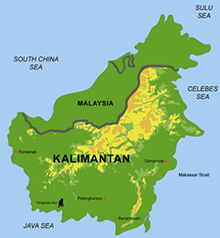 Of the 5.6 million hectare land around Sampit, 4.8 million hectare were processed, 2.5 million hectare for 1999 and 2003. It was found that oil palm plantation (Elaeis guineensis) between Palangkanbun and Sampit increased by more than 50 % from approx. 143,000 ha 5.7% in 1999 to 218,000 ha 8.7% in 2003. In the West of the Katingan river there are many places with small-scale gold mining in quartz-sand.